ISAT and Kinetics isolation bases. There is NONE BETTER for Engineering services, manufacturing and testing capabilities - all backed by the industry’s most experienced staff. 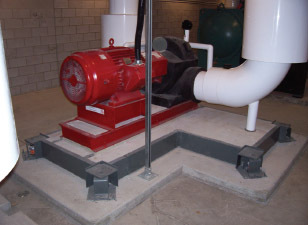 Specifically designed and engineered to receive field poured concrete, inertia bases are used to provide a rigid mounting platform to support mechanical equipment on vibration isolators. 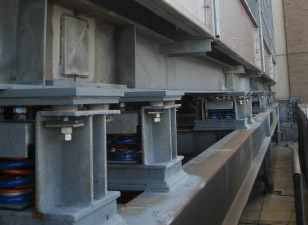 The added mass of the concrete reduces differential movement between driving and driven members, reduces rocking by lowering equipment center of gravity, reduces motion of equipment during start-up and shut-down, acts to reduce reaction movement due to operating loads on equipment, and as a noise barrier. 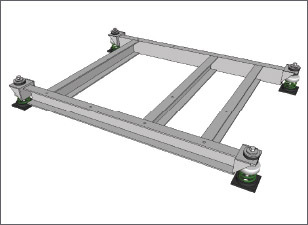 Used to support mechanical equipment and provide rigid platforms for attachment of vibration isolators, without allowing excessive differential movement between driving and driven members. Typical uses include support and isolation of reciprocating chillers, close coupled pumps, vent sets, packaged air handling units, centrifugal fans, evaporative condensers, and similar types of equipment. Used to support mechanical equipment and provide a means of attaching supporting isolators while maintaining a rigid supporting surface for the isolated equipment. Typical uses include support and isolation of absorption chillers, hermetic centrifugal chillers, package boilers, cooling towers, and similar types of equipment.